Tags: David Peters, US Poker Open. Posted on Monday, February 25, 2019 by "T". David Peters emerged triumphant in a player field of 33 to claim the prize of $1,320,000 in the U.S. Poker Open Event #10: $100,000 Main Event. The 2019 U.S. 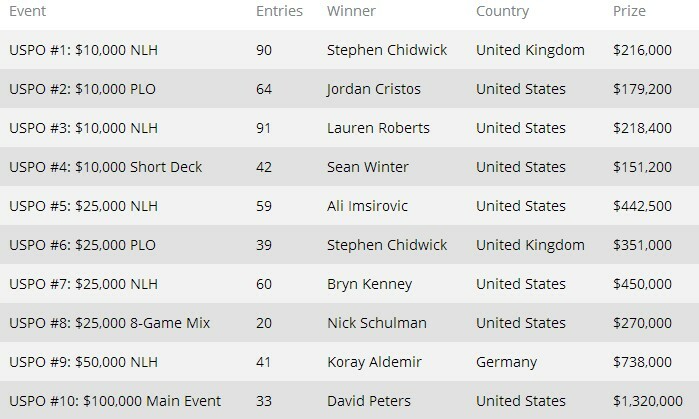 Poker Open ended its 10-event series on Saturday evening after one out of 33 players won in Event #10: $100,000 Main Event. Not only did 31-year-old David Peters managed to win the Main Event title for a whopping $1.32 million, but he also rose above the leaderboard to win the overall US Poker Open Championship title for an extra $100,000 prize! 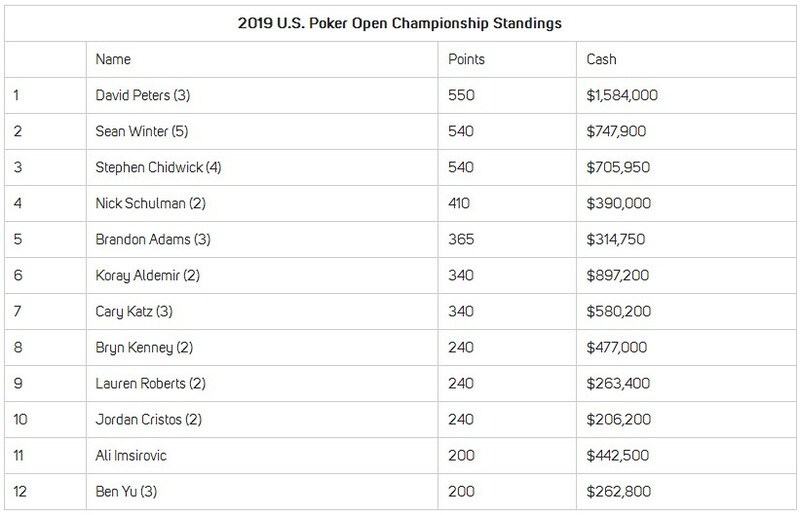 Before the final table began, it was Sean Winter who was the favorite to win the overall US Poker Open standings, but things didn't go well for him. His failure became an open window for Peters as he only needed just one win to get it, and he did. Peters said after he won, "This feels amazing. This is obviously a very prestigious tournament, a great series, and to come from behind and to pass Sean by 10 points at the very end, that's a pretty-pretty crazy feeling. I'm just always trying to get better. I put in an endless amount of hours away from the table and it feels great to see all the hard work pay off. I'm always very hungry, always wanting to get better and better and better and better and that's not going to stop. I hope to keep that keep that going." He added, "This is my favorite trophy and one of my favorite all-time wins for sure." EPT Malta: David Peters Wins The High Roller And €597,000! 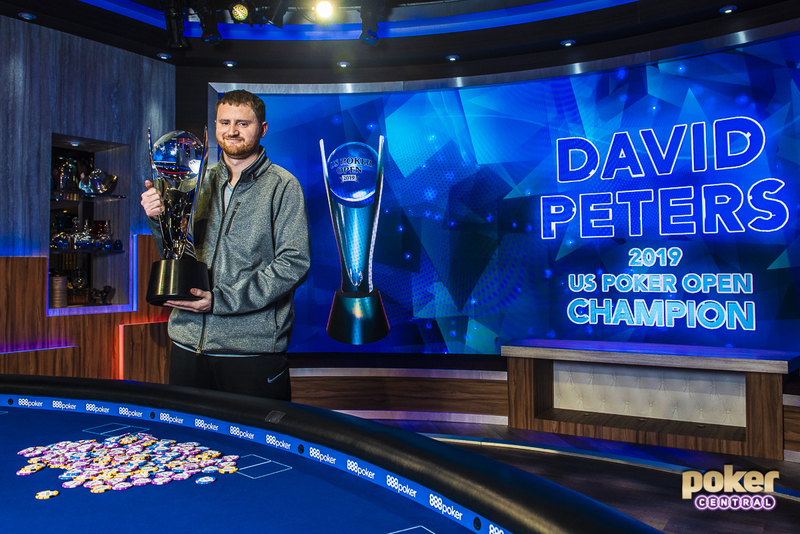 8 comments for "2019 US Poker Open Main Event and Championship Title won by David Peters"
Many congratulations to David Peters on winning this very prestigious event. These $100,000 buy in tournaments seem to be commonplace at the moment and we all dream of the day when we can afford to enter one!! such a big buy in,you can imagine what can you buy for this money and still to have rest of this amount to enjoy and this players spend on just one buy in for tournament!first prize is very nice,but when you see buy in,its not so big!for normal player its like you invest 100 $ and you earn 1320 $!you would be rich much after that! Not always the favorite win and this thing has been seen very often. David Peters was very lucky and managed to make the surprise. The Americans did not rush to buy the entrance in the $ 100k game and unfortunately for Sean Winter, his rival won this game. He lost some money and the fate was not with him. A high stakes game, with 100k USD buy in. since everyone had invested a small fortune in the tournament. Five players were getting paid out of thirty three. Tournaments with these tangibles hardly have huge playerpools.